COMPLIMENTARY CONSULTATION Tired of being Disorganized? DOWNLOAD YOUR FREE DECLUTTER REPORT! strategies for creating an organized life you love. Whether you work in a huge corporation or you’re a solopreneur plugging away by yourself at home, chances are you often feel as is there aren’t enough hours in the day. And it’s true. So since your To Do list never gets any shorter, knowing how to squeeze the most out of the time you have is critical if you want to get ahead at work. 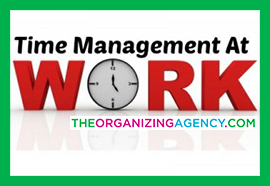 Managing your time isn’t about getting more done, it’s about getting things done efficiently. To help you identify the areas where you may not be making the most of the time you have, www.MindTools.com created a useful quiz, and offered ideas on how to address the most common challenges. Delete It: Don’t need it? Why save it? Do It: If the email is something that can be answered quickly (in a minute or two), take care of it immediately. Delegate It: if you know the right person for the job, share the email with them right away. Defer It: If the email requires more attention, schedule a specific time to deal with it at a later date. Is your To Do list as long as your arm? Don’t try to take on everything at once. Break down your list into bite-sized chunks and start to tick them off one at a time. You’ll have a greater sense of accomplishment when you can complete several smaller items, than if you spent half the workday worrying about a huge project that you can’t seem to make a dent in. Take the last 15 minutes of each day to plan how you’ll spend your time tomorrow. Make sure that the tasks you have scheduled each day are directly correlated to the most important deadlines ahead. Schedule five minutes before every meeting to review and prepare. Schedule another brief block of time directly following the meeting to email any documents or action items that were discussed, so you’ll have a fresh record of what transpired and you won’t need to revisit it later in the day. Let it ring! Just because your phone rings or your email pings doesn’t mean you have to drop what you’re doing and answer it. Stay focused on what you’re doing by turning off the ringer, silencing your Blackberry (no vibrate either! ), and even setting an autoreply from your email account, if necessary. You do not owe anyone your attention at the exact moment they request it, so don’t feel guilty if you practice the dying art of concentrating on a single task at once. Prioritizing tasks and effectively handling interruptions are only part of the time management equation. As with any important project, you have to start out by setting goals. What do you want to achieve today? This week? This month? If you clearly identify what you want to accomplish in the short and long terms, then you can create and maintain your work schedule with more satisfying results. What challenges do you face staying on task at work? What techniques have you found to maximize your productivity? Certified Professional Organizer®, Scott Roewer is founder of The Organizing Agency, a professional organization and productivity company devoted to teaching residential and business clients how to increase productivity, save money, and how to live a more organized and abundant life. An award winning company, in 2013, The Organizing Agency was once again awarded the Angie’s List Super Service award, in 2012 the National Association of Professional Organizers recognized Scott with its top honor, the Founders’ Award, and later the same year, the U.S. Air Force commended his volunteerism, naming him Joint Base Andrews “Hometown Hero.” For more information on Scott’s team and how they can help you, contact the office online or call us directly at 202-249-8330. Your first visit has already changed my life. Even my husband was impressed. Months, ok years, of clutter miraculously gone or organized. Brings tears to my eyes. Please call our office and speak to a team member directly to discuss how The Organizing Agency can help you organize your personal and professional life!